Imagine a space where Doctors and Designers alike can come together and solve some of the toughest challenges in healthcare in one of the most evocative spaces in Philadelphia. 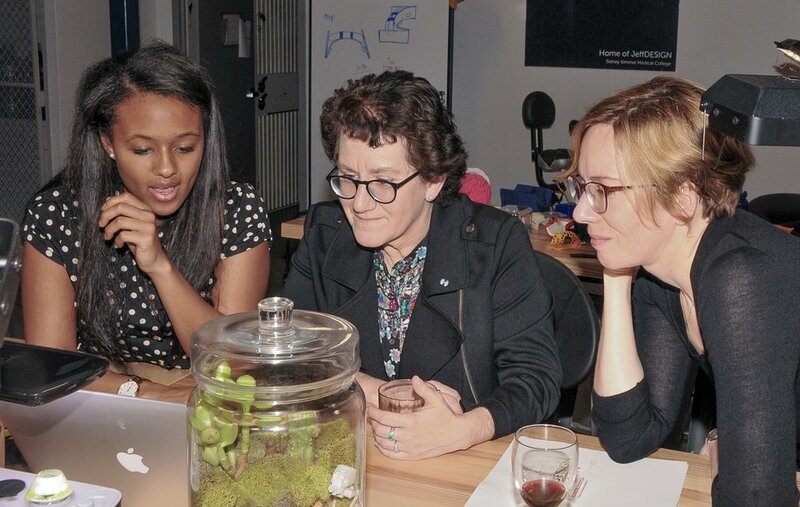 The Health Design Lab @JeffInnovation exists to bring people together, including patients, who in the past may never have interacted with the goal of accelerating change and translating technological innovation to real innovations at the bedside. 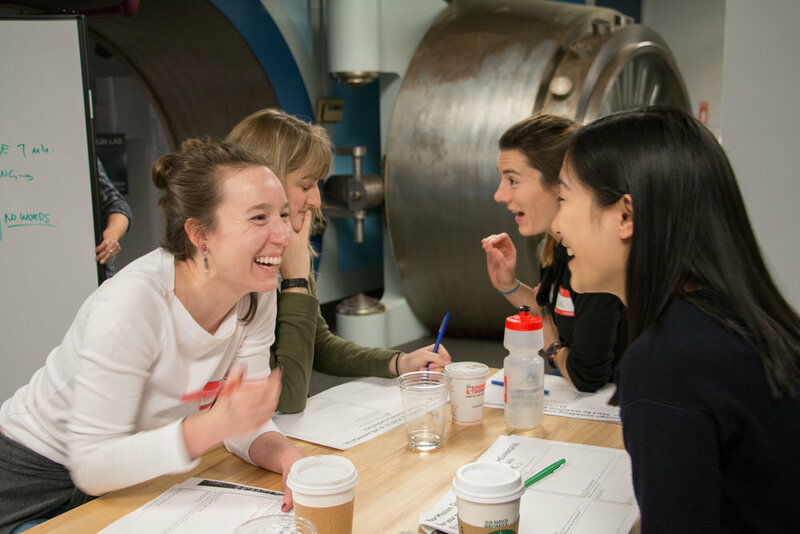 Fueled by traditional and modern prototyping technology and a foundation of person-centered design principles, the Health Design Lab is more than just a maker space, but a space that will change the way we all think about the future of healthcare. Join me on this photographic journey on the development and grand opening of The Health Design Lab @JeffInnovation! After a year of development, The Health Design Lab @JeffInnovation had its ribbon cutting on November 30th, 2016. 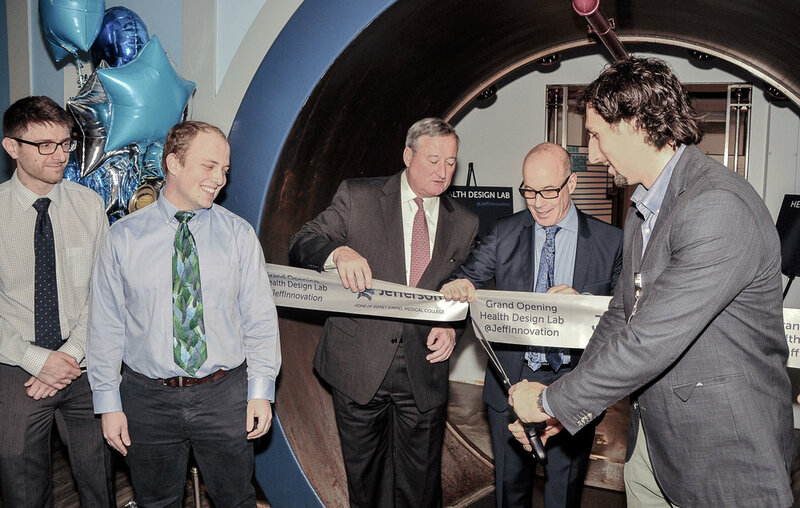 Here you see Sidney Kimmel Medical College Students Mark Mallozzi, Tim Bober, and Lorenzo Albala cutting the ribbon with The Honorable Jim Kenney, Mayor of Philadelphia, and Dr. Stephen K. Klasko, President and CEO of Thomas Jefferson University and Jefferson Health. Home to the Second Federal Reserve Bank of Philadelphia from 1918 to 1976, the building at 925 Chestnut Street houses one of the worlds largest bank vault doors in its basement. The former banking floor one story up, still mostly intact with the crest of the US Treasury on the ceiling, now houses the executive offices of Jefferson Health. After the Reserve Banks relocation in 1976, The Vault has been used for numerous things over the years and had more recently become a dumping ground and storage space for the building. It was widely recognized by those who knew of The Vault's existence that such a structure had incredible potential not only due to the uniqueness of this engineering marvel but also for the evocative nature of such a space. Special Assistant to the President, saw this potential and had a vision for the creation of a new and exciting space for innovation at Jefferson in this mostly forgotten space. To help develop the space, she found a partner in Dr. Bon Ku, EM Physician and Director of the College-within-a-College for Design program, aka JeffDESIGN, at Sidney Kimmel Medical College. On opening night, Dr. Ku spoke about the exciting work that the students of JeffDESIGN have been doing since the program began and how the new space will help accelerate innovation and grass roots change in healthcare. 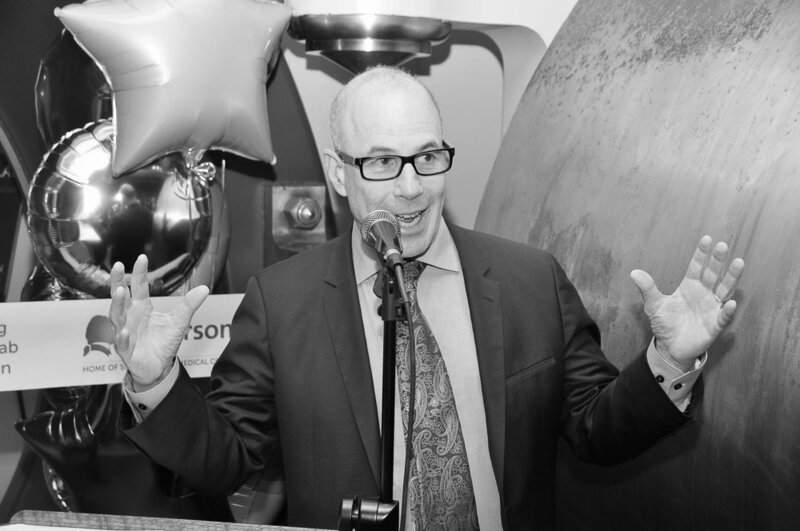 Dr. Klasko also spoke about the many exciting things happening at Jefferson, focusing on the future of the Thomas Jefferson University as it merges with Philadelphia University and how The Health Design Lab exemplifies this new cross-disciplinary partnership. We were especially excited to have Mayor Kenney in attendance. He spoke a few words about our incredible students, how much he loves Jefferson, and how he is proud to have places like this in the great City of Philadelphia. Drs. Bon Ku and Robert Pugliese, excited to show off the work the students are doing with Mayor Kenney. Dr. Pugliese explains how 3D printing gives us the capability to do advanced prototyping and even create functional devices, speeding up the innovative process. Alexus Cooper, a 2nd year medical student, discusses her work with Dr. Rose Ritts and Megan Voeller, Director of Humanities at Thomas Jefferson University. Mayor Kenney testing out a virtual reality surgical training simulator. JeffDESIGN Medical Students, Alexus Cooper and Micaela Collins, with a pediatric medical play doll developed in the Lab. 1st year SKMC medical students participate in Design Thinking Bootcamp to quickly build Design Thinking muscles when they first join the program. Design Thinking provides a framework for creative problem solving that gives students the power to think differently about tough challenges in healthcare. The core of this framework is the development of empathy, which informs all other steps of the design process. Here, students get their ideas out of their head by rapidly prototyping and testing concepts. Design Thinking promotes a Bias Towards Action, enabling one to challenge assumptions early. Often times, thinking on your feet, in the literal sense enables you to get your creative juices flowing. Ideation exercises like this one enable you to think big and brainstorm with others. 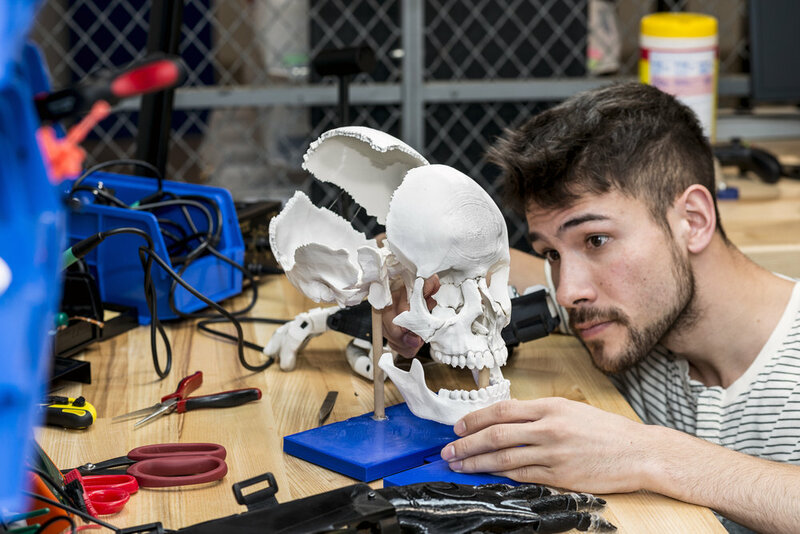 2nd year medical student, Justin Turpin, making some final adjustments on his 3D printed skull model. 2nd year medical student, Alexus Cooper, testing out a 3D printed functional prosthetic hand that was printed on the 3D printers behind her in the Lab. JeffDESIGN Medical Students, testing out a few different versions of 3D printed prosthetic hands, including a robotic hand that can be produced at a fraction of the cost of commercial robotic prosthetics. 2nd year medical student, Terry Gao, demonstrating anatomical characteristics using a 3D printed skull model. The 3rd cohort of JeffDESIGN medical students begin their journey together in Design and Medicine. In the fall of 2017, JeffDESIGN will have students across all four years of medical school at Sidney Kimmel Medical College. The Vault of the former Second Federal Reserve Bank of Philadelphia has found new life with Jefferson Innovation and JeffDESIGN.